The obsessions and compulsions associated with OCD sometimes result in an individual’s having difficulty discarding and/or acquiring items or possessions. For example, some people with OCD have fears or feelings that something bad or catastrophic will happen if they throw something away. In other situations, individuals have feelings of incompleteness if something is given or thrown away; they may have a need to document and preserve all of their life experiences (e.g., keeping all of the toys they owned as a child). In some cases, a person’s fears of contamination lead to difficulties with discarding or acquiring items. Due to fears that items on the floor are contaminated, for example, an individual may be unable to touch them in order to throw them away. As a result, the floors in one’s home may be covered with items that should be discarded. Contamination fears may also lead to a person’s buying everything in a store he or she has touched – and thereby “contaminated” – to prevent others from becoming contaminated. 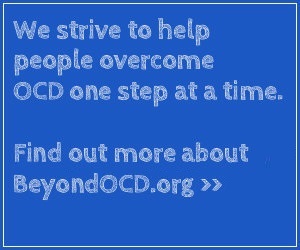 There are a number of other reasons why individuals with OCD have difficulty discarding and/or acquiring objects. “Magic numbers” may result in excessive acquisition, because a person feels compelled to buy everything in multiples of his or her magic number. Avoidance of repetitive rituals may also play a role: a person may avoid throwing out old mail, for example, because it would trigger endless, anxiety-laden checking rituals. Or fears of making the wrong decision about discarding something may be so intense that it becomes easier not to discard anything. Regardless of the obsessions and rituals associated with this form of hoarding, the result is the accumulation – in some cases, excessive – of items or objects. In the past, hoarding was usually associated with OCD. The Diagnostic and Statistical Manual of Mental Disorders, Fifth Edition (DSM-5) now makes a distinction between forms of hoarding associated with the obsessions and compulsions of OCD (as described above) and a separate disorder: Hoarding Disorder. According to the DSM-5, hoarding related to OCD is generally unwanted and highly distressing; the individual derives no pleasure or reward from it. In addition, the individual shows no interest in most of the saved items – they have no sentimental or intrinsic value. People who hoard in the context of OCD are also more likely to accumulate bizarre items, such as trash, used diapers, or rotten food. By contrast, Hoarding Disorder is not characterized by intrusive, distressing, or unpleasant obsessions. Hoarding thoughts are part of the individual’s normal train of thought, are not repetitive in the same way typical obsessions are and usually do not create distress. In addition, there is no ritualistic quality associated with Hoarding Disorder – that is, it’s not an active attempt to neutralize unwanted thoughts, images, or impulses. Furthermore, Hoarding Disorder is frequently associated with positive feelings of excitement and pleasure, if not exhilaration related to acquiring items (although distress may result from the product of hoarding behavior: clutter). Also, individuals with Hoarding Disorder believe their possessions are useful or have aesthetic value, even though others would deem them useless or of limited value. Moreover, they do form attachments to items and may experience distress (e.g., grief, anger, anxiety) at the prospect of discarding them. This is extremely true for individuals who hoard animals: they have an intense emotional attachment to the creatures they hoard, whether they be dogs, cats, birds, chickens, rats, rodents or any other animal. With Hoarding Disorder, the need to save possessions and the distress associated with parting with them results in an accumulation of items that clutter and obstruct living areas, preventing them from being used as intended. Difficulties discarding items and/or clutter causes impairment in functioning, including maintaining a safe environment for self and others. Note: When severe hoarding occurs along with other typical symptoms of OCD, but is deemed to be separate from OCD symptoms, a diagnosis of both OCD and Hoarding Disorder may be made.